The Neck Hammock is a cervical traction device created by a physical therapist that helps you gently stretch out the muscles in your neck to provide a dose of relief from aches, kinks, and pain. It’s easy to use and is adjustable to hang at the right height from a doorknob or railing. It packs up for on-the-go use, too, so you can enjoy a relaxing stretch just about anywhere. Dimensions: 3.6" x 8.75" x 6.6"
Good for relief and relaxing! Provides the relief one needs when you don’t have the second pair of hands to get the relief you need. Dr. Steve Sudell created The Neck Hammock to complement cervical traction treatment you might get at physical therapy—and Steve knows, because he has a doctorate in physical therapy. 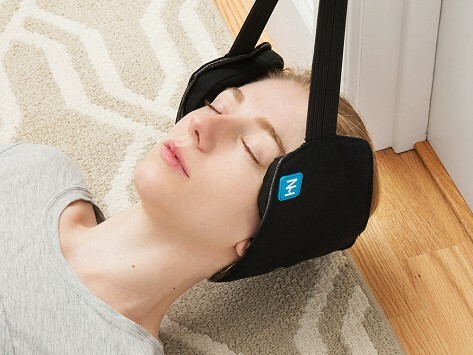 The soft device cradles your head and gently stretches neck muscles. Those of us who work at desks and spend a lot of time typing (and texting) can benefit from opening up this area that often gets compressed, which can lead to aches and pains. But even if you don’t have any neck discomfort, The Neck Hammock is a comfortable way to relax and Zen out for a few minutes. The device is easy to set up and it hangs from a doorknob or railing. It's adjustable and folds up compactly to take with you on the go, so you can stretch out that post-travel stiffness. Steve recommends listening to your body when using The Neck Hammock. How high you hang it—and how long you use it—is entirely up to you. Start with a 10 minute session and see how good you can feel.